Today I want to talk about how to choose a manual bush trimmer – a tool that helps to put in order the bushes in the courtyard or garden. A hedge trimmer (bush trimmer, bush cutter, edge trimmer) is a hand trimmer tool designed to cut bushes, shrubs and other tree-like vegetation. Rotation speed (number of moves). Some experts do not distinguish trimmer for bushes as a separate type of tools. We, however, considering the specifics and varieties of this tool, will consider it as a separate representative of garden machinery. Petrol (gas) bush trimmer. Such instruments have a gasoline engine, such as a chainsaw or a grass trimmer. The advantage of a manual gasoline bush trimmer is that it can be used regardless of the availability of a power grid that is important for work in the garden or in other areas away from home. Electric bush trimmer. An electric trimmer works from an electrical grid and should be constantly connected to it. Cordless (rechargeable battery powered) hedge trimmer. The battery hedge cutters work from the installed battery. Such tools have relatively less power, as well as limited operating hours without recharging, but they are lighter than gasoline models and do not require a permanent connection to the network, as electric. Separately, we can say about mechanical manual cutters or simply – about ordinary garden scissors. Mechanical bush cutter – this is the most reliable and proven tool and for training muscle of hands is very useful. If you choose professional hedge trimmer among the above types, you can consider the following advice: if you have good access to the electrical network – choose an electric trimmer, it is cheaper and has less weight. In other cases buy a gasoline model. Cordless bush cutter can be taken in cases where you have small volumes of work and the average diameter of the branches of shrubs does not exceed 10 cm. The average power of an electric trimmer can range from 0.4 (small hedge trimmer) to 0.6 kW. Gasoline bush trimmers can have up to 0.8-0.9 kW power. As you can see, the difference power is quit small, accordingly the optimum will be the average indicator at the level of 0.5-0.6 kW. 2. Length of the cutter tire. The tire (knife) of the bush trimmer, like the chainsaw ones, is its main cutting element. The length of the bus depends on what volume of bushes can cover the tool in one pass. With a long tire, the effectiveness of working with large shrubs increases, but maneuverability is reduced. Electrical and gasoline bush cutters can have a tire in length from 40 to 70 cm, rechargeable from 8 to 55-60 cm. The length of the tire can be chosen based on personal preferences and convenience of work, on the average you can focus on the length of 50-60 cm. 3. Hedge trimmer rotation speed (number of moves). The quality of the cut depends on the speed of rotation or the number of knife moves. Higher speed provides the more “clean” cut. This parameter is measured by the number of revolutions (moves) per minute and can be in the range from 1800 to 3400 rev/min. For example, the Bosch AHS-60-16 trimmer has a frequency of 3400 rpm. at a power of 0.45 kW. When choosing a hand hedge trimmer focus on a speed of 2,200 rpm. Also, when shopping, you need to pay attention to the garden trimmer handle. You have to take the tool in your hands and try it – whether it is convenient for you to work with his handle, as it will directly affect the quality and duration of your work. 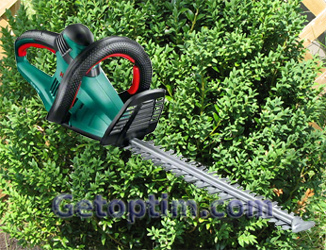 I hope these simple tips will help you to buy the best garden bush trimmer. I plan to buy a hedge trimmer next spring. Thanks for the tips!